1. Get down on your hands and feet, with your hands shoulder-width apart, your legs straight and your hips up. 2. Bend your elbows, until your arms form a 90 degree angle, and bring your head close to the mat. 3. Straighten your elbows, pushing your body away from the mat, and return to the starting position. Start with your arms in line with your spine, straighten your back, engage your core and keep your upper and lower body at a 90 degree angle. Breathe in as you bend your elbows, and lower your body until your head almost touches the mat. Exhale as you straighten your arms and push back to the initial position. The pike push up is a great exercise for building shoulder strength and improving core stability. 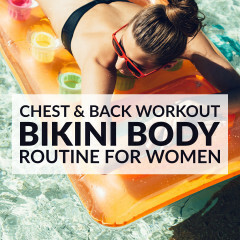 This exercise works your shoulders, arms, chest, back and core, and helps to tone and strengthen your entire upper body. Complete 3 sets of 15 to 20 repetitions. If pike push ups are too challenging for you, start with knee push ups and bodyweight push ups, to increase muscle strength.